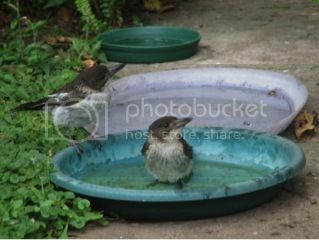 Birds need fresh water, but they are vulnerable when they are drinking or bathing and need to feel safe. Here are some tips to help you provide birds with a safe, clean birdbath or pond. 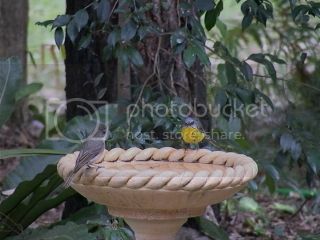 Place your birdbath so birds can perch nearby to observe the surrounding areas before bathing (so not in the middle of a patch of shrubs) but make sure there are dense shrubs or trees nearby that birds can escape to if necessary. Place your birdbath beyond the reach of cats - hang it from a tree or use a pedestal bath. If you have no cats with access to your yard then even a pot saucer on the ground makes a suitable bird bath. Keep the water cool. Birds prefer birdbaths that are placed in dappled shade. Replace the water regularly so it is always clean. Clean the birdbath regularly but don't use cleaning agents. Scrub and rise with clean water. If the bath is deep or has a smooth base (such as a glazed pot), place pebbles or a brick in it so that if a bird falls in it is able to grip on and climb out. Going away? Ask a neighbour to add water, so your birds don't lose their water supply. Ponds should be large enough for birds to drink or bath outside the reach of cats or other threats. Place an old branch in the water or have a large rock as an island, which they can stand on safely while drinking. Provide different water levels; different bird species use different depths of water. As with birdbaths, it is best if ponds have shrubs and plantings near by for birds to observe from, or escape to. Ponds are also great for attracting other wildlife, especially frogs.